Just three days after reaching a defection deal with the government, six defecting Khmer Rouge commanders promised Monday in Phnom Penh that Cambodia’s 30 years of war have come to an end. However, the men declined to elaborate on the “political struggle” that they said would replace the military one they are abandoning. They also denied knowledge of the whereabouts of hard-line Khmer Rouge military chief Ta Mok. Government military commanders and the Khmer Rouge de­fectors are describing Friday’s defection deal as the end of the 30-year-old guerrilla movement that ruled the country for nearly four years. 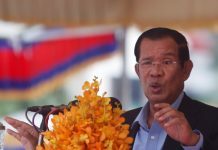 “Our defection is the last of the forces….There will be no more fighting,” said 49-year-old Khem Nguon, chief of staff for a beleaguered Khmer Rouge fighting force that finally quit after suffering two mass defections and the loss of their two largest strongholds in the last two years. 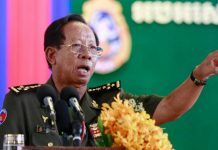 The defecting commanders said Monday that they have not been in contact with Ta Mok, Khieu Samphan or Nuon Chea for seven months. As standing committee members of the Democratic Kampuchea regime, the at-large trio are considered by researchers to be responsible for crimes against humanity. The defection comes at a time when Asean is fretting over whether the regional grouping can extend membership to a country torn by military and ideological disputes for 30 years. A defection deal was signed Friday at Preah Vihear Temple, a 10th-century symbol of the Khmer empire. In March, the government occupied it for the first time in five years when Khmer Rouge units based there defected. The commanders said they will bring 20,000 civilians and soldiers back into society, although army officials at the press conference said problems such as mine removal must be dealt with first. No conditions have been announced as part of the defection deal. Civilians are expected to return to the homes in northern Cambodia that they fled during fighting related to the pro-government mutiny in Anlong Veng in March. The guerrilla solders, estimated at less than 1,000, will join RCAF, officials have said. Monday was Khem Nguon’s first time in Phnom Penh since 1975. He was joined at the round, wooden Ministry of Information table by Meas Muth, Ta Mok’s son-in-law who Cambodian military officials said earlier this year would never defect to the government. Two of the eight defecting commanders, including division 519 chief Dul Saroeun, did not show for the press conference. The defectors said Monday they had decided to join the Phnom Penh government after international recognition came through for a CPP-Funcinpec coalition pact agreed upon last month at a summit chaired by King Norodom Sihanouk. Meas Muth, believed to be in his mid-50s, said better political currents influenced the defection. “I am pleased with the political program of the two parties and I think it is right,” said Meas Muth, who on Monday looked more like a grandfather than a guerrilla war commander. Funcinpec and the CPP reunited in a second coalition government and a joint political program 17 months after the first coalition collapsed amid tank battles in Phnom Penh in July 1997, when forces loyal to Second Prime Minister Hun Sen effectively ousted Prince Norodom Rana­riddh from the first premiership. The new coalition agreement also dislodged more than three months of political stalemate following a disputed CPP victory in July’s elections. The Khmer Rouge boycotted 1993’s UN-sponsored elections, which were won by Funcinpec but resulted in an ill-fated coalition after a CPP-led secessionist movement in the east. Before that, the Khmer Rouge fought alongside various resistance forces aligned with Funcinpec against the Hanoi-backed People’s Republic of Kampuchea regime, a one-party communist state run by the CPP’s precursor. In 1996, former Democratic Kampuchea deputy prime minister Ieng Sary defected, taking with him the gem-mining town of Pailin and thousands of Khmer Rouge soldiers and civilians. 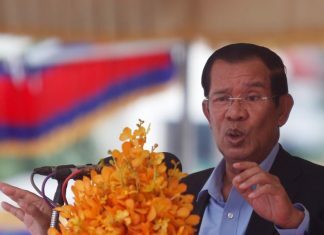 And a March uprising in An­long Veng delivered the Khmer Rouge’s military command post of eight years into government hands and stripped hard-line forces of more than 2,000 troops. Also at the press conference was Iem Phan, the former RCAF Division 16 commander; Ta Them, a top hard-line military commander; Nuon Nou, who has identified himself as Ta Mok’s economic adviser; and Kem Khet, about whom little is known. The defectors denied any re­sponsibility for atrocities committed during the Khmer Rouge’s 1975-1978 Democratic Kampu­chea regime, and researchers and analysts said they doubt they were in a position during that time to be responsible for crimes against humanity. Defectors in April have, however, alleged that the internal security chiefs in Anlong Veng systematically executed thousands of families between 1993 and the mutiny in March that set all of the prisoners free. Evidence of a rumored new “killing field” near Anlong Veng has yet to be found.